Proudly wear the colours of the only French university in Western Canada. 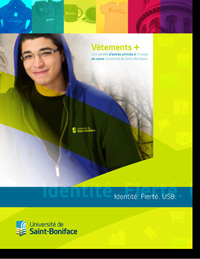 Université de Saint-Boniface sells at reasonable prices a variety of articles of clothing and items inked or engraved with its logo. USB merchandise is also the perfect gift for a graduant. Offer him or her the gift of school spirit. To see the full range of items or for information on how to place an order, download our catalogue by clicking the link below. To place an order, contact our Recruitment Office.